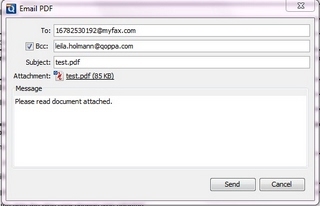 Q: Can I send a PDF document as a fax directly from PDF Studio? A: Customers who are enrolled in online fax services can send faxes directly from within PDF Studio by simply using the email feature available under File->Email from the top menu. Online fax services such as myfax.com or efax.com let users easily send faxes via email instead of having to print a document and use the printer machine. On the receiving end, online fax services also allow to receive faxes electronically by email. So for instance, assuming you are enrolled in myfax.com and want to send a document to Qoppa Software’s fax number at 678-253-0192, you would simply send an email to 16782530192@myfax.com.